5 Cutting operations are usually necessary to obtain the desired blank shape or size to trim the part to final size. Mechanical cutting is accomplished by a variety of methods, including straight shearing using guillotine knives, circle shearing using circular knives horizontally and vertically positioned, sawing using high speed steel blades, blanking, and nibbling. Blanking uses metal punches and dies to punch out the shape by shearing. Nibbling is a process of cutting by blanking out a series of overlapping holes and is ideally suited for irregular shapes. 6 Surface finish is an important specification for stainless steel products and is critical in applications where appearance is also important. Certain surface finishes also make stainless steel easier to clean, which is obviously important for sanitary applications. A smooth surface as obtained by polishing also provides better corrosion resistance. On the other hand, rough finishes are often required for lubrication applications, as well as to facilitate further manufacturing steps. 7 After the stainless steel in its various forms are packed and shipped to the fabricator or end user, a variety of other processes are needed. 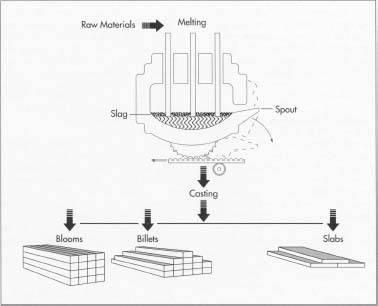 Further shaping is accomplished using a variety of methods, such as roll forming, press forming, forging, press drawing, and extrusion. 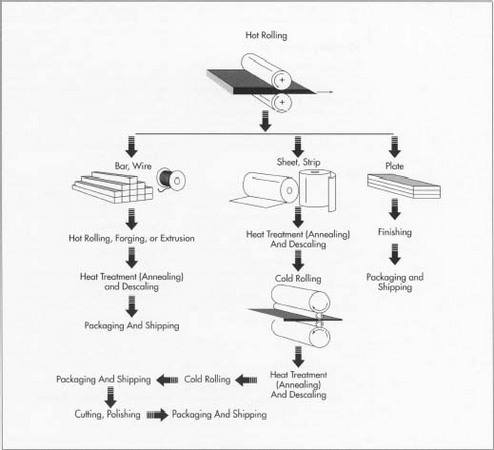 Additional heat treating (annealing), machining, and cleaning processes are also often required. There are a variety of methods for joining stainless steel, with welding being the most common. Fusion and resistance welding are the two basic methods generally used with many variations for both. In fusion welding, heat is provided by an electric arc struck between an electrode and the metal to be welded. In resistance welding, bonding is the result of heat and pressure. Heat is produced by the resistance to the flow of electric current through the parts to be welded, and pressure is applied by the electrodes. After parts are welded together, they must be cleaned around the joined area. With improvements in process technology, superaustenitic stainless steels (with nitrogen contents up to 0.5 percent) are being developed. These steels are used in pulp-mill bleach plants, sea water and phosphoric-acid handling systems, scrubbers, offshore platforms, and other highly corrosive applications. A number of manufacturers have begun marketing such materials in sheet, plate, and other forms. Other new compositions are being developed: ferritic iron-base alloys containing 8 and 12 percent Cr for magnetic applications, and austenitic stainless with extra low sulfur content for parts used in the manufacture of semiconductors and pharmaceuticals. Cleaning and Descaling Stainless Steels. American Iron and Steel Institute, 1982. Finishes for Stainless Steel. American Iron and Steel Institute, June, 1983. Llewellyn, D. T. Steels: Metallurgy & Applications. Butterworth-Heinemann, 1992. MacMillan, Angus, ed. The Steel-Alloying Handbook. Elkay Publishing Services, 1993. Stainless Steel & Heat Resisting Steels. Iron & Steel Society, Inc., 1990. Davison, Ralph M. and James D. Redmond. "Practical Guide to Using Duplex Stainless Steels." Materials Performance. January, 1990, pp. 57-62. Hasimoto, Misao. "Combined Deposition Processes Create New Composites." Research & Development. October, 1989. Tuthill, Arthur and Richard Avery. "Specifying Stainless Steel Surface Treatments." Advanced Materials & Processes. December, 1992, pp. 34-38. I read this article and liked it very much as it increased my insight about the SS making processes. I am a mechanical Engineer and i m very much interested about knowing the various forming processes on stainless steel. I want to know the utensils making processes from stainless steel. so it will be very much helpful if you add this information in your article. Wow,These article are helpful in my report.Thank you. This is the best article on the manufacturing process of stainless steel. The author is not only adept at the subject but is also a great writer. Good article. However the steel will only stay in the furnace for about 40 minutes. The furnace uses 200k - 400k Amp currents and it quickly melts the steel. Please can you provide a Pie Chart to show referrence.